Download the VSCC notes on Austin 7 eligibility. All members of the PWA7C are automatically members of the Inter-Register Club. This association of one-make clubs was founded nearly fifty years ago with the sole aim of allowing its members to participate in competitive events that their own clubs would probably be too small to support on their own. Without exception its events are friendly, sociable and only gently competitive, and in any one year there are usually about eight of them spread across the country. Typically these include scatter and regularity rallies, gymkhanas, treasure hunts and the like. Currently two other Austin clubs (The 750 MC and the Austin Ten Drivers Club) belong – along with the Alvis, Crossley, Fiat, Humber, Riley and Sunbeam Talbot Darracq Registers. Inter-Register events are listed in the PWA7C magazine while regulations and entry forms can be obtained from the club's I-R C representative. Download the Events Calender 2019. The Inter-Register Club's calendar of events includes a good mix of navigational tests including scatter rallies, regularity rallies, driving tests, treasure hunts and of course the Nightjar night rally. 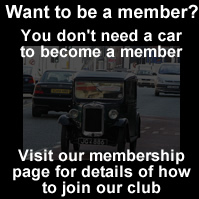 The Austin 7 really is the ideal car for these friendly well run events and as a member of the PWA7C you can enter the Inter-Register events and represent our club. Indeed by doing so you score points for our club that count towards the end of season awards. All the events are listed on the club website, and entry forms and regulations will be uploaded onto the website before each event. If you would like to know any more about taking part in I-RC events then please contact your club representative, Robert Rhodes, by email or on 07747756549.